Buried deep in the stacks of Edinburgh libraries lie court records that tell stories about early America. In the Faculty of Advocates Library and The Signet Library, both just a few doors down from Scotland’s Court of Session, and in the Centre for Research Collections at the University of Edinburgh, rests evidence of Glaswegian merchants who traded for Virginia tobacco, families divided by the American Revolution, enslaved men and women who toiled on Caribbean sugar plantations, and much more. These Session Papers, the printed material submitted to Scotland’s supreme civil court as part of the litigation process, contain hidden histories of early America and the British Atlantic world. Through a generous grant from the William Nelson Cromwell Foundation, a team of historians from Special Collections at the University of Virginia School of Law’s Arthur J. Morris Law Library will soon visit Edinburgh to begin identifying court cases involving early American litigants. Drs. Jim Ambuske, Randi Flaherty, and Loren Moulds, the co-directors of the Law Library’s Scottish Court of Session Project, will travel to Scotland’s capital to investigate these court records. While some cases appear in published law reports, most remain hidden in the bound volumes of court documents held by these historic Edinburgh libraries. The Cromwell Foundation, which supports American legal history scholarship, has commissioned the Law Library team to survey Court of Session cases involving early America. Working closely with Edinburgh librarians, Ambuske, Flaherty, and Moulds will locate such cases and prepare a publicly available report on their findings. The report will enhance the discoverability of these cases for future scholars working on legal or early American history projects. It will also help identify groups of Session Papers for priority digitization as part of a collaboration to make these records more accessible for legal and historical research. Finding evidence of early America in the Session Papers will illuminate the close ties between Scotland and America in the eighteenth and early nineteenth centuries. As the historian Timothy J. Shannon has recently shown in his new book, Indian Captive, Indian King: Peter Williamson in America and Britain, Session Papers can recover the lives of individuals like Williamson. In the mid-eighteenth century, the Aberdeen native claimed to have been kidnapped and sold into indentured servitude in the American colonies. While it seems clear that he was in the colonies as a young man, and perhaps later fought in the French and Indian War, his claim to have been held captive by Native Americans at one point is more suspect. Nevertheless, Williamson “played Indian” for Scottish audiences upon his return home and parlayed his alleged experiences into commercial opportunities. We know of his story in part because he sued the Magistrates of Aberdeen in the Court of Session, charging that they had been complicit in an illegal servant trade that had sent him to North America. While in Scotland, the Law Library team will meet with collaborators at the University of Edinburgh, the Edinburgh Law School, and representatives from the Advocates and Signet libraries to advance a transatlantic partnership that is pursuing the creation of a digital archive to hold nearly 250,000 individual Session Papers. Using a combination of computer technology and human interpretation, the collaborators are exploring ways to more efficiently identify people and places within these printed documents, which will assist in the cataloging process, enable digital humanists to conduct large-scale analyses of the material, and make it easier for scholars and the public to search for historical figures and locations. The project team is grateful to the Cromwell Foundation for its significant investment in the Scottish Court of Session Project. For more information on the Foundation and its efforts to support legal history scholarship, please visit www.cromwellfoundation.org. To learn more about Special Collections at the Arthur J. Morris Law Library, please visit archives.law.virginia.edu. The UVA Law Library and the John L. Nau III Center for Civil War History are pleased to announce the C.S.S. Alabama Claims Cases Transcription Project. The over 100 documents in this collection center on the life and death of the British-built commerce raider C.S.S. Alabama and her sister ships, the C.S.S. Florida and the C.S.S. Shenandoah. Constructed in Liverpool, England in 1862, the Alabama disrupted Union commerce and supply lines in both Atlantic and Pacific waters during the Civil War. Between 1862 and 1864, Captain Raphael Semmes and the Alabama’s crew conducted seven major raids in waters ranging from the Gulf of Mexico to the Java Sea. They attacked or destroyed nearly seventy Union merchant ships, capturing or burning millions of dollars’ worth of cargo before the U.S.S. Kearsarge sank the Alabama on June 19, 1864 off the coast of France. The Alabama’s success as a commerce raider made for a point of contention between the United States and Great Britain. After the war the American government held its British counterpart liable for damages. American citizens sought compensation for property lost to these British-built Confederate vessels. In 1871, the two nations signed the Treaty of Washington, which established an international arbitration process for resolving these disputes. The treaty marked a significant development in modern international law. In the end, the British government paid the United States $15.5 million in damages. William Crapo, printed in Phineas Camp Headley, Public Men of To-day, 1882. The C.S.S. Alabama Claims Cases Transcription Project features 108 documents from the law practice of Boston attorney and future U.S. Congressman William W. Crapo. Between 1870 and 1876, Crapo (pronounced “Cray-poe”) corresponded with numerous individuals such as attorneys Henry A. Barling and A. H. Davis as he worked to secure restitution from the British government on behalf of his clients. He also worked with bankers, insurance officials, and individual claimants. The letters and telegrams record how lawyers lobbied Congress and President Ulysses S. Grant’s administration as they pursued claims against the British government. They offer a unique perspective on the Civi War’s legal and diplomatic legacy. UVA Law librarians completed an initial transcription of the Crapo material in the early 1990s. We now seek eagle-eyed members of the community to help refine that earlier work using Fromthepage.com, a crowdsourcing transcription platform to help enable their discovery and use by researchers. As far as we are aware, historians have never cited this collection in any scholarly research. the compensation & next because of a hesitancy most people have of giving Powers of Atty. even to their intimates. Johnson & Higgins I know to be honorable people & ones that would not abuse a trust — still, you could get a power where they could not because every claimant in N.B. has confidence in you. Now what I want to get at is, if we fail with J & H in getting what we aimed at the other day, I think I can suggest to you a plain (sic) that all the parties at interest will jump at, & in which your interests as well as our own can be as well cared for as by the arrangement now pending, but I will not suggest it now as it might be taken as a symptom of bad faith toward J. & H. — by whom I intend to stick until I see they cannot succeed & then if you will join B. & D we can, with proper energy, & I assume we both have enough of it, make a very handsome business of it. The above letter hints at discussions with clients concerning New York Insurance firm Johnson & Higgins. Barling’s plea for secrecy suggests a strategy in flux as the lawyers navigated complex legal and political shoals. The remaining papers in the collection describe in detail how lawyers and their clients negotiated deals and lobbied powerful individuals in defense of their legal interests. Correcting the transcriptions will provide new insight into the Civil War era and the legal world it created. To start transcribing, visit the project’s webpage and signup for a free account on FromThePage. Participants in this project will find a complete set of instructions on the project website. Once finished, the UVA Law Library will make the completed transcriptions available on its website. Charles C. Beaman, Jr. The National and Private “Alabama Claims” and Their “Final and Amicable Settlement” (Washington, D.C., 1871). Charles S.C. Bowen. The “Alabama” Claims and Arbitration Considered from a Legal Point of View (London, 1868). Adrian Cook. The Alabama Claims: American Politics and Anglo-American Relations, 1865-1872 (Ithaca, NY, 1975). James McPherson. War on the Waters: The Union and Confederate Navies, 1861-1865. (Chapel Hill, 2012). Frank J. Merli. Great Britain and the Confederate Navy, 1861-1865. Thirty years after the University of Virginia School of Law acquired a trove of legal documents from Scotland’s Court of Session, the supreme legal court there, the Law School’s Arthur J. Morris Law Library is building a digital archive and reaching out to partners “across the pond” to open these legal history materials to scholars and the public. When complete, the archive will provide users with access to the previously hidden histories of people living through an era of profound change. Last week, the Special Collections team traveled to Edinburgh, Scotland, to present the digital project at the annual meeting of the Scottish Records Association and to meet with colleagues at the University of Edinburgh Library, who are pursuing a similar initiative. The Dome Room in the New Register House at the National Records of Scotland holds documents, including legal records, that date back to 1553. Photo courtesy of Special Collections. The Court of Session, as Scotland’s highest civil court, hears cases dealing with divorce, real estate, bankruptcy, intellectual property, debt and a variety of other civil matters. In the mid-1980s, the Law Library purchased a collection of documents related to about 2,500 cases heard before the court between 1757 and 1834. The University of Edinburgh Library, the National Library of Scotland, the Faculty of Advocates Library and the Signet Library hold more than 4,000 volumes of the court’s papers combined. Unlike the handwritten manuscripts produced by English or American courts from this period, the Court of Session did its work in print. Memorials, petitions and even evidence were given to the court in this form. Today, the clear type makes the collection more accessible to researchers and easier to digitize. Users will be able to search through a single document or the entire collection, peruse the rich data provided for each case and download documents for free. War, revolution and the Enlightenment transformed the lives of 18th and 19nth century peoples living around the Atlantic basin. These documents illuminate the lives of Scottish merchants trading with colonial Virginia tobacco planters; provide insight into the transatlantic slave trade; show how Scottish women defend their limited legal rights; and trace conflicts between literary figures and their publishers, among other stories. For example, the copyright dispute at the heart of Clark v. Bell (1804) opens an entry point into the early history of the Encyclopedia Britannica. Among the sources creators Colin Macfarquhar and Andrew Bell consulted was work by James Clark, a veterinarian and King George III’s farrier in Scotland. In 1801, Clark sued Bell (Macfarquhar having since died) for copyright infringement under the Copyright Act of 1710. Clark alleged that the two men had incorporated verbatim portions of his two treatises on equine care without his consent. After “the best and most valuable parts of them are inserted in the Encyclopaedia Britannica,” publishers refused to issue new editions of his work, Clark said. He charged that Bell and Macfarquhar had violated the Copyright Act, harming his business interests and reducing his potential income. The court agreed. The Lords of Session (as the judges are called) sided with Clark and later affirmed judgement on appeal. 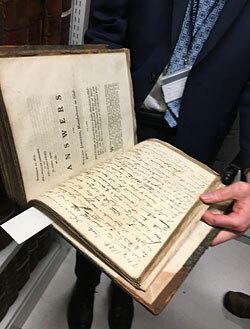 Joseph Marshall, head of special collections and the Centre for Research Collections at the University of Edinburgh Library, shows an example of a bound volume of documents held in the library’s collection. Photo courtesy of Special Collections. Collaborating with the Edinburgh-based coalition will allow the Law Library’s Special Collections team to continue to bring rich legal materials like these to light as we trade knowledge and expertise with our colleagues abroad. It will also enable the two groups to reconstruct case histories in digital space, making it easier for scholars, genealogists, bibliophiles and law students to access a complete case record. Compiled in leather-bound volumes (like similar collections in Scotland) at one point, the Law Library’s documents were removed from their bindings sometime after 1835. They rest now in archival boxes that consume 64 feet of shelf space in the Library’s Special Collections unit — as we steadily continue to digitize their contents. The Law Library is preparing to release its first batch of documents. Look for them online soon. For more information on the project, including how you can support it, contact archives@law.virginia.edu. Late Spring brings new growth to Special Collections at the Law Library as academics everywhere turn their thoughts to Summer research and writing. We are fortunate to have two stellar individuals joining the team over the next few months in partnership with UVA’s Institute for Public History to spearhead two important legal history projects. Third year Abby Holland will contribute to the Dean Lile Diaries digitization project this summer. Abby Holland, a rising 3rd year American Studies major with a concentration in race and ethnicity, brings her experience working with Civil War diaries in Small Special Collections and the digital tool Neatline to the Dairies of William Minor Lile project. Born into an Alabama slaveholding family in 1859, Lile studied law at the University of Virginia in the early 1880s. He later settled in Lynchburg to practice his trade. In 1893, UVA’s Board of Visitors appointed Lile to a law professorship in the expectation that he would succeed his great uncle, John B. Minor, as head of the law department. Minor died in 1895. Nine years later, during a period of administrative reorganization, university president Edwin Alderman named Lile as the Law School’s first dean. Lile died in 1935. Lile produced an eleven-volume journal over the course of his adult life. The entries begin in 1882 and cease in 1932. They record Lile’s experiences in post-Civil War and Reconstruction Virginia as the United States entered the Gilded Age and the new international order. Lile’s journals illuminate the intersection of local and national politics and culture. They detail his participation in numerous Virginia and regional legal cases, comment on Democratic and Republican politics at the state and federal levels, technological changes such as the introduction of automobiles in Charlottesville, prohibition activities, and economic booms and busts that gripped the nation. Abby will spend the summer developing her digital history skills by preparing a new transcription of one of Lile’s volumes and writing interpretive essays that introduce readers to him. Her work is part of an on-going effort to prepare a digital documentary edition of these wonderful journals. She will also pursue a project of her own design based on the diaries that will enrich our understanding of the law, Virginia, and the United States during a period of chaotic transformation. Melissa Gismondi comes onboard as co-director of our Digital 1828 Catalogue Collection Project, an initiative supported by the Jefferson Trust Foundation. Melissa specializes in the history of nineteenth-century North America. She recently defended her dissertation and will receive her Ph.D. in August 2017. Her work focuses on the military and political partnership of President Andrew Jackson and his wife, Rachel, which she is developing into a book. She is also the moderator of BookStory, a new book club from BackStory, a program of the Virginia Foundation for the Humanities. History Ph.D. candidate Melissa Gismondi is co-director of our Digital 1828 Catalogue Collection Project. “In 1820, Thomas Jefferson believed the new University of Virginia would empower the ‘illimitable freedom of the human mind, to explore and to expose every subject susceptible of it’s contemplation.’ Jefferson envisioned the library as the centerpiece of university life and the foundation of his grand vision for American education. In 1824, he selected 7,000 volumes, including over 700 law books, to fill the library’s shelves. Jefferson believed that enabling access to these texts at UVA would overcome economic disparities and create educational opportunities for a broad audience. ‘Great standard works of established reputation, too voluminous and too expensive for private libraries,’ he wrote to the university’s purchasing agent, ‘should have a place in every public library, for the free resort of individuals.’ In Jefferson’s mind, an easily accessible library should be one of the cornerstones of a democratic society by allowing citizens and scholars convenient access to knowledge and the tools to create new knowledge. Over the next few months Melissa will create interpretive content for the new 1828 site, explore interesting facets about particular texts, and help us lay the groundwork for new scholarship centered on these fascinating volumes. Along the way she’ll develop her own professional interest in digital history and engage the public through social media. Both Abby and Melissa will contribute regularly to this blog over this summer. Be sure to follow us on social media for updates about these exciting initiatives. The Digital Archives in the Commonwealth Summit aims to highlight the growing number of significant and innovative efforts to conceive of and construct digital archives within Virginia. A joint effort between the University of Virginia Law Library, the Virginia Foundation for the Humanities, the Washington and Lee University Library, and the Omohundro Institute of Early American History and Culture, the Summit will serve as a forum for the impressive efforts of those within the Commonwealth contributing to or interested in the digitization and interpretation of archival materials. The Summit will be an open-ended conference assembling individuals and institutions across disciplines—including but not limited to archivists, scholars, librarians, museum specialists, and technologists—who are expanding and grappling with the role of archives and archives-based research in the digital age. It will be an opportunity to present past, future, and ongoing digital archives projects and to explore practical, theoretical, and methodological issues regarding the convergence of archival practice, scholarly research, and pedagogy. We welcome proposals of individual papers and complete panels of three to four speakers (15 minutes per speaker), workshops (50 minutes), and participants in a digital archives lightning round (5 minutes per speaker). How do digital surrogates change our interpretation, use, or understanding of physical materials? New techniques of interfacing, indexing, and discovering content within collections. Methods of expanding access, assessing public engagement, and promoting digital archives projects. New models of description, interpretation, or analysis of digital archives. The inclusion of critical archives theory in archival practice, such as encouraging a focus on collecting and highlighting materials from understudied subjects and persons, opening collections to new audiences and methods of interpretation, or discussions the privileged role archives play in historical memory making. The value of digitization in terms of the preservation of the cultural record. Discussions on the convergence of technologists, archivists, and scholars inside and outside the archives, particularly regarding collaborative methods of selecting, processing, interpreting, and teaching with collections and digital archives. Institutional issues surrounding funding, prioritization, collaboration, or the digital humanities. The technological underpinnings of digital archives creation including digitization methods, transcription, development of data models, standards-based metadata, hosting solutions, data management, the application of empirical data techniques, and data visualization. Digital archives as pedagogical instruments in classroom instruction and public engagement. Questions? Please contact Jim Ambuske (jpa4ad@virginia.edu). Looking for a Public History Internship in Summer 2017? Join the Special Collections Team at the Law Library. The Special Collections team at the Arthur J. Morris Law Library is looking for two excellent summer interns to help us with exciting projects in digital history. We’ve partnered with UVA’s Institute for Public History to create two experiential learning opportunities for one undergraduate and one graduate student. The first initiative is the “Digital 1828 Catalogue Collection Project.” It will help illuminate the history of the Law School and Thomas Jefferson’s vision for legal education in the early American republic. We aim to build a virtual library that will hold digitized copies of the over 700 legal texts originally listed in the university library’s 1828 catalogue. Our goal is inspire new research in legal history by making these rare volumes easily accessible to scholars, and create a new tool that will help other libraries digitally preserve their own rare book collections. We seek a graduate student to help us digitize the volumes, perform research on the texts, and work with us and our partners across grounds to develop the website. The second project is “Diary of a Dean: The Life of William Minor Lile.” The Law School’s first dean was born two years before the outbreak of the American Civil War and died two years after Adolf Hitler assumed power in Nazi Germany. In 1882, Lile began the first of what became an eleven volume journal. The entries document life in Charlottesville and Virginia as the post-war United States began to exert greater influence on the world stage. We seek an undergraduate student to help us digitize all eleven journals, assist in the creation of a new transcription of the volumes, and develop some interpretative content for the website. These internships are designed to give students practical public history experience in a team-based environment that includes the Digital Collections Librarian, Postdoctoral Fellow in Digital Humanities, Archivist, and the metadata specialists. We’ll work with you to accomplish your own professional goals as we together tell stories about the past. Please see the Institute for Public History’s website for complete details about the internships and the application form. Applications are due to Lisa Goff, director of the institute, by 5 p.m. on 3 February 2017. If you have questions about either of the internships please contact Jim Ambuske or Loren Moulds. The rancorous 2016 presidential election concluded on November 8th with Republican Donald J. Trump’s dramatic upset victory over Democrat Hillary Clinton. Voters went to the polls to choose the nation’s next leader, and by doing so entrusted the next president with the power to shape the composition of the Supreme Court for a generation. President-elect Trump will now have the opportunity to nominate a replacement for Justice Antonin Scalia, whose death earlier this year created a vacancy that remains unfilled despite President Obama’s nomination of Judge Merrick Garland. On the campaign trail and the debate stage both Clinton and Trump spoke to the kind of justices they would appoint to the court. It served as a reminder of the Supreme Court’s political nature and the central role that the justices who compose it play in forming a more perfect Union. The passing of a former Supreme Court law clerk four days before the election affords us a chance to pull back the granite curtain on the court’s inner workings during an earlier period of intense division within American society. E. Barrett Prettyman, Jr., who died on November 4, 2016 after a long career of public service and a successful private practice, clerked for the Court in the mid-1950s when it handed down its momentous decision in Brown v. Board of Education. The unanimous decision in that case overturned the “separate but equal” racial segregation precedent established in Plessy v. Ferguson (1896) by declaring that segregation in public schools violated the Equal Protection Clause of the 14th Amendment. The landmark case was a crucial moment in the early Civil Rights Movement, a period in which Americans of every creed and color contested the fundamental meanings of liberty, equality, and citizenship in the republic. with the signatures of the Supreme Court Justices. In 1986, Prettyman donated a large portion of his legal papers to the Arthur J. Morris Law Library. They offer valuable insights into the Court’s internal deliberations over Brown v. Board of Education and other prominent cases in the period. Equally important, they put a human face on some of the Court’s black-robed personalities and illuminate the special bond that clerks formed with their justices as they together interpreted and refined American law. Prettyman, Jr. was a 1949 Yale University graduate and the son of Judge E. Barrett Prettyman of the U.S. Court of Appeals for the District of Columbia Circuit. The younger Prettyman completed his law degree in 1953 at the University of Virginia School of Law. During his time at UVA he was a member of the Student Legal Forum, an organization newly created to bring prominent legal minds to Grounds. In 1951, Prettyman, no doubt benefiting from his father’s position on the appellate court, arranged for Associate Justice Robert H. Jackson to speak on Grounds. Two years later Justice Jackson hired Prettyman to serve as one of his law clerks at a salary of $5,175.50. His performance warranted a nearly $1,000 raise the following year, but he joined Justice John M. Harlan in November 1954 after Justice Jackson suffered a fatal heart attack. Prettyman served Justice Felix Frankfurter during this period as well. Becoming Justice Jackson’s law clerk in 1953 thrust Prettymen into the Court’s deliberations over Brown v. Board of Education. The justices first heard arguments in the consolidated case the previous December and ordered re-arguments for the fall of 1953. Some of the justices, particularly Frankfurter, hoped that in the interim Congress would outlaw public school segregation and thus avoid the need for judicial intervention. Justice Stanley F. Reed preferred that the states end segregation on their own terms. Despite their collective misgivings many of the justices were at least open to the idea of striking down the Plessy doctrine. Others required more convincing. The proponents for overturning the “separate but equal” precedent feared that an opinion issued by a divided court risked undermining the legitimacy of the ruling. Dissenting opinions could lend a measure of credence to the belief that segregation was constitutionally sound and bolster advocates for segregation in state and local communities. While Frankfurter did not get his wish for congressional intervention, the death of Chief Justice Fred M. Vinson in September 1953 changed the Court’s dynamics in unexpected ways. The Kentuckian’s fellow justices believed that he would vote to uphold Plessy on the basis of well-established judicial precedent. Vinson’s demise was for Frankfurter “the first indication I have ever had that there is a God.” It brought a new chief justice to the Court in the form of California Governor Earl Warren and the potential for a unanimous decision in Brown’s favor. After the Court reheard arguments in December 1953 the new chief famously worked to persuade his colleagues, including Justice Reed, that overturning Plessy was both a legal and moral imperative. The Court would issue a unanimous decision to strike down the separate but equal doctrine. The question then became whether the justices would release a single opinion or deliver multiple concurring statements. For a number of months Justice Jackson considered authoring a separate opinion. He believed that Plessy should be undone, although he struggled to find a satisfactory legal theory to support his position. His draft opinion well reflected this difficulty in its conclusion that the “mere possession of colored blood, in whole or in part, no longer affords a reasonable basis for a classification for educational purposes and that each individual must be rated on his own merit.” In other words, instead of identifying a precise point of law with which segregation conflicted, Justice Jackson’s opinion rested on the assumption that segregation was no longer legally defensible. Even then the main thesis occupied very little space in his draft document. The opinion itself meandered through an exploration of southern culture and African–American advancement in post-Civil War America to the legislative history of the 5th and 14th Amendments and their respective Due Process Clauses, the problem of enforcing the Court’s order, and the acceptance of segregation’s constitutionality in American history. Only then did Justice Jackson weakly assert that segregation no longer had a legal basis. The Justice gave his draft opinion to Prettyman for his evaluation. The young lawyer immediately recognized its unfocused nature. Indeed, as Prettyman pointed out to Justice Jackson in a lengthy critique, the legal reasoning to strike down Plessy was stated “in only two out of 23 pages” and was “almost an afterthought.” Prettyman was blunt with his mentor: The document had an “apologetic” tone as if “you were ashamed to reach” its conclusion. Delivering a sheepish concurring opinion, he argued, would undermine the Court’s authority because “Some one must make these decisions, and under our system the burden is on the courts.” An opinion should be confidently argued and forcefully given to retain the public’s confidence in the Court’s decision. Whatever conclusions the majority or individual justices reached, the public needed to feel that “it is a decision based upon law” and not the wishes of “a bunch of liberals in Washington” foisting their views on the masses. E. Barrett Prettyman, Jr., Re Nos. 1-4, c. March-May 1954. Prettyman believed that Justice Jackson’s draft opinion appeared weak and apologetic in part because the Justice could not say with precision how he knew that sufficient racial equality had been achieved or when it had happened. Both Justice Jackson’s draft opinion and Prettyman’s memorandum traded in contemporary ideas of racial inferiority and uplift that informed sociological and intellectual attitudes about African Americans in the mid-twentieth century. Prettyman suggested that the Justice restructure his opinion by moving his conclusion to the beginning and justifying it through an exploration of the expansion of public education in the United States. He pointed to the Justice’s underlying theme that “public education is no longer for the privileged few” and that as America had “adopted [Thomas] Jefferson’s great dream” of a broadly educated public, “mass education, for all people, is simply an established fact in this country today.” Repackaging his discussion about black social and intellectual advancement since Emancipation would then allow the Justice to counter pro-segregation arguments based on assertions of racial inequality and in turn argue that “the races are no longer sufficiently unequal or distinct to warrant” separate but equal policies. Justice Jackson ultimately decided not to issue a concurring opinion. A combination of his initial heart attack in March 1954, his own inability to develop a sound legal theory, and Chief Justice Warren’s desire for a unified statement prevented him from finishing the work. In a memo from December 1954, Prettyman recorded that Justice Jackson was about to begin refining his opinion based on his clerk’s critique when he became ill. Nevertheless, one morning, following a visit from Chief Justice Warren to his hospital room, Justice Jackson asked Prettyman to write a concise paragraph based on his evaluation. The Chief Justice was due back in the afternoon and Justice Jackson believed that Warren’s own draft opinion “could use a little more law.” While the paragraph is not among Prettyman’s papers in the UVA Law Library, Prettyman’s memo suggests that he delivered to Justice Jackson language that declared an end to legal segregation in general, and not just in public education. The two justices discussed Prettyman’s paragraph (with Jackson giving the Chief Justice an oral summary of it) before deciding that the Court’s final opinion should remain focused just on segregation in public education. The Court, with Justice Jackson in attendance despite his recent heart attack, announced its decision on May 17, 1954. The bond between Prettyman and the justices he served extended far beyond their intellectual discussions about the law. Humorous exchanges at surprising moments hinted at the respect and even the friendship that they felt for one another. An exchange between Prettyman and Justices Frankfurter and Hugo Black illustrates this point. On April 20, 1955, the Court reheard oral arguments in the case of Ellis v. Dixon. The case pitted James R. Ellis, the president of the Yonkers Committee for Peace, against William Dixon and the members of the Board of Education of the City of Yonkers. The Committee wanted to use Yonkers public school buildings to hold a forum on peace and war, but the school board denied its request. The Committee claimed that the Yonkers school board had violated the First and Fourteenth Amendment rights of its members. Unfortunately for the Committee, its lawyers could not really say just how the Yonkers school board had violated their constitutional rights. They conceded that the school board had the power to deny use of its facilities to non-scholastic groups and claimed that the school board applied state and local regulations selectively, although they could not offer the Court a specific example. Justice Felix Frankfurter to Prettyman, 20 April 1955. Prettyman retreated to his office to type out a formal “opinion” that held Justice Frankfurter in violation of the agreement. He sent it to Frankfurter who was, as a reminder, still sitting on the bench hearing the case. The justice soon sent it back with his replies. Prettyman reiterated that Frankfurter had promised to remain silent during the lawyer’s oral argument and that the lawyer had not yet rested his case when Frankfurter spoke. “The ‘case’ is over,” Frankfurter replied, “in the sense in which the word ‘case’ was used in context.” That was to say, it wasn’t much of a case at all. To Prettyman’s observation that Justice Black had overruled him, Frankfurter responded that he “did not know [Black] had that power without four more.” Finally, Prettyman lamented that while Frankfurter laid claim to the money and jelly beans, he had said nothing about the pat on the back. “That’s a sad commentary on our friendship,” Prettyman ribbed. Frankfurter underlined “pat on the back” and exclaimed that “I’d rather have that than even 60 jelly beans!” His view of the case was vindicated when the Court ruled 5-4 that the writ of certiorari had been improvidently granted. Prettyman and Frankfurter exchange # 7, 20 April 1955. What the E. Barrett Prettyman, Jr. Papers at UVA’s Morris Law Library offer us is a rare view into the Supreme Court’s inner sanctum and the people who inhabited it at a critical turning point in American history. The Court’s decision in Brown v. Board of Education lent momentum to a growing Civil Rights Movement that transformed American society in profound ways. Prettyman’s files allow us to glimpse into the Court’s internal struggle to reach a decision and into Justice Jackson’s ultimately futile search for a legal theory to support his concurrence. They also reveal a more human side of the Court, one that shows the justices as capable of humor and warmth even as they sat on the bench hearing a case. In January 2017, President-elect Trump will begin the process of reshaping the Supreme Court by appointing a new woman or man to fill Justice Scalia’s seat. If the recent election is any indication, the person whom Mr. Trump nominates will probably provoke passions on both sides of the political spectrum on his or her way through a contentious confirmation process. The Prettyman Papers can help scholars and the interested public look past the ideological walls often thrown up during a change in the Court’s structure to see the justices and those with whom they worked on their own terms as they grappled with important matters of law and society. Researchers wishing to consult this important collection may do so online or in person by contacting the Arthur J. Morris Law Library at lawarchives@virginia.edu. Featured image: Justice Harlan at a 1965 reunion with his law clerks. Prettyman stands behind and to the right of Justice Harlan, center. From The Papers of E. Barrett Prettyman, Jr. 1944 – 1982. Prettyman, Jr. donated another collection of his papers to the Special Collections Library at the University of Maryland. See E. Barrett Prettyman papers, Special Collections, University of Maryland Libraries, http://hdl.handle.net/1903.1/1530; For more on the relationship between Prettyman, Jr. and Justice Jackson, see the Robert H. Jackson Papers, 1892-1954 in the Library of Congress, http://hdl.loc.gov/loc.mss/eadmss.ms003002. Robert H. Jackson to E. Barrett Prettyman, Jr., 8 October 1951; Jackson to Prettyman, Jr., 6 November 1951, Papers of E. Barrett Prettyman, Jr. MSS 86-5, Box 1, Special Collections, University of Virginia Law Library. Justice Jackson’s secretary to J. C. Reynolds, 18 May 1953; Contract to Clerk for Robert H. Jackson, 1 June 1954; Prettyman, Jr. to John M. Harlan, 12 November 1954, all in Ibid. Frankfurter quoted in Michael J. Klarman, Brown v. Board of Education and the Civil Rights Movement (New York and London: Oxford University Press, 2007), 67. My account of these deliberations follows James T. Patterson, Brown v. Board of Education: A Civil Rights Milestone and Its Troubled Legacy (New York and London: Oxford University Press, 2001), 52-65; Klarman, Brown v. Board, 55-78. See Risa L. Goluboff, The Lost Promise of Civil Rights (Cambridge and London: Harvard University Press, 2007), for an important look at the history of American civil rights law before Brown v. Board of Education. “Memorandum by Mr. Justice Jackson” in Mark Tushnet, ed., I Dissent: Great Opposing Opinions in Landmark Supreme Court Cases (Boston: Beacon Press, 2008), 144. As Tushnet notes, Justice Jackson’s opinion was not a dissent, but he chose to include it in his edited collection for the provocative ways that pro-segregationists might have turned it into a de facto dissent. Prettyman, Re Nos. 1-4, c. March-May 1954, Prettyman Papers, MSS 86-5, Box 2. Prettyman, Re Nos. 1-4, c. March-May 1954, MSS 86-5, Box 2. The original copy of Justice Jackson’s memo is in the Library of Congress. See “Memorandum by Mr. Justice Jackson.” Brown file, Robert H Jackson Papers. Library of Congress. The document came to light after William H. Rehnquist’s 1986 Senate confirmation hearings to become chief justice. In 1952, Rehnquist had written a memo for Justice Jackson entitled “A Random Thought on the Segregation Cases” in which he argued that “Plessy v. Ferguson was right and should be re-affirmed.” The memo became a source of contention during the confirmation hearings as Rehnquist claimed that it reflected Justice Jackson’s views and not his own. Justice Jackson’s draft concurring opinion in Brown v. Board of Education suggests otherwise. See Bernard Schwartz, A History of the Supreme Court (New York and Oxford: Oxford University Press, 1993), 289-291. Prettyman, “Notes re Segregation Decision, 15 December 1954, Prettyman Papers, MSS 86-5, Box 2. The notes exchanged between Prettyman, Frankfurter, and Black are all dated 20 April 1955 and are in Prettyman Papers, MSS 86-5, Box 4. I have not found the specific article that Prettyman alludes to, but Walter Isaacson discuses Einstein’s candy-for-homework-help bargains in his Einstein: His Life and Universe (New York: Simon & Schuster, 2007), 439-440. Kent Olson, Head of Research Services at the UVA Law Library, worked his magic to turn up an article in The Washington Post from 1940 that mentions Einstein’s quid pro quo. See Leonard Lyons, “The New Yorker,” The Washington Post, 24 October 1940. Prettyman to Marsha Trimble Rogers, 16 March 1989, Prettyman Papers, MSS 86-5, Box 4. Ellis v. Dixon (1955). For Prettyman, Jr.’s analysis of the case and his recommendation that the writ of certiorari be dismissed as improvidently granted see “Memorandum by Pretty Regarding Ellis v. Dixon, circa 1955,” Prettyman Papers, MSS 86-5, Box 2. The term “Lightning Round” may call to mind nerve-racking Quiz Bowls from grade school or the fast and furious stock-picking segment of Jim Cramer’s CNBC show Mad Money. In recent years, however, the lightning round has become a feature of academic conferences and symposia, especially those that involve the digital humanities. Speakers deliver quick presentations of about three minutes each to highlight the core essence of a new project, scholarly method, digital tool, or teaching resource. These rapid fire talks, like the one that I gave with Project Director Loren Moulds on the Scottish Court of Sessions Records Digital Archive at the recent DH@UVA Conference, seek to promote one’s work in ways that stimulate future conversations or potential collaborations. The traditional academic conference mind meld usually involves a series of panels composed of three or four presenters delivering twenty-minute presentations to their peers on their latest work. They underscore Karin Wulf’s important point that conferences continue to serve as “a vital and distinctive forum for scholarly exchange.” This format is a useful way to articulate an evolving argument or new methodological intervention in some detail, creating the opportunity for the presenter to receive helpful comments or critiques of their scholarship from the audience while contributing to our body of knowledge. It can also be difficult at times to understand the payoff of any given paper. I have seen—and given—presentations that lack focus or struggle to convey a project’s major points and an answer to the “so what?” question at the heart of any academic research initiative. We’ve all been there. We’ve all listened to and delivered them. These presentations are like Dementors for which we have no effective Patronus Charm. Incorporating Lightning Rounds into the conference format will never ward off all of the demons, but it does offer practical and pedagogical ways to reinvigorate an intellectual gathering. This is not to say that we should abandon traditional panels altogether. It is simply to suggest that seasoning our conferences with Lightning Rounds can add some much needed flavor. 1. Speakers typically have three minutes to talk. 2. Visual components to the presentation are limited to three slides. 3. The official Time Keeper enforces the three-minute limit with vigorous enthusiasm. Speakers are afforded a 15-second warning before their time ends. Violators are subject to public scorn. (Not really, but it is considered uncouth to go beyond your allocated time). 4. All presentation slides are packaged into one PowerPoint for ease of transition between speakers. 5. Brief live-demos of projects are fair game as well so long as the speaker stays within the three minutes. Loren and I used the DH@UVA Conference to talk about our Scottish Court of Session Project and begin to build relationships with people who might want to use this splendid collection or help us think through the challenges of building a digital archive. Slide 1: Scottish Court of Session Records website home page on the UVA Law Library Special Collections website. In a nutshell, the Law Library began to develop this project nearly two years ago under the direction of Loren and former postdoctoral fellow Randi Flaherty, now a fellow at the Robert H. Smith International Center for Jefferson Studies at Monticello. We are constructing a Drupal-based digital archive out of 64 linear feet of legal records produced by the Scottish Court of Session. The court is Scotland’s civil court of first instance and appeal. The Law Library Special Collections and Archives holds about 2,500 cases that date between 1759 and 1834. As Randi noted in the project’s early days, and what has only become clearer as we continue the work, these documents reveal hidden histories of trade, migration, and life in the British Empire in the years surrounding the American Revolution. Repositories in Edinburgh and Aberdeen hold the largest Session collections. These holdings date back to the sixteenth century and they are indexed principally by case name. The index provides an excellent entry point into the material. It also reflects the choices that all archives face concerning how much time and energy should be allocated to heavily describing particular collections as opposed to others. The National Records in Scotland and its associated archives are charged with preserving the rich history of an ancient nation. Making records accessible for scholarly and pubic use is a daunting task that shapes decisions about the level of detail that should be provided. The team behind the Georgian Papers Project, an initiative to digitize and describe the papers of George III and his family, is wrestling with these questions at this very moment. So are we at the Law Library as we dive into our Session records in earnest. The relatively smaller size of our Sessions collection affords us the flexibility to experiment with our description process and build into this digital archive ways to collaborate with our fellow institutions in the future. While these cases contain petitions, court briefs, and appendixes, they reveal more than contested points of law. They pull back the curtain on the everyday lives of people living in Scotland or circulating in the British Atlantic in the late eighteenth and early nineteenth centuries. They contain correspondence, census lists, voter rolls, corporate charters, shipping records, marriage contracts, and a wealth of other data, along with maps, architectural renderings, and patent designs created as part of the litigation process. This archive within an archive reveals how people used their property, how they ran their businesses, how old friends became enemies, how woman used the law to defend their interests, and how individuals established personal and economic connections that spanned an ocean and an empire. And almost all of our documents, like the collections in Scotland, feature marginalia created by their former owners that are unique to each collection. We have developed a rich description process to extract metadata from these complex materials. Students and staff tease out valuable information such as the people named in the documents, where they lived, their roles in cases, their relationships to each other, and to what organizations they belonged, among other data points. We are also looking at ways to augment the collection through additional research on people and organizations, and to signal to scholars the variety of sources one might encounter in these materials. Metadata creation is currently underway in anticipation of beginning large-scale digitization in 2017. Our hope is that this project generates new questions about the British Atlantic World as it underwent a period of remarkable change. Students will handle the bulk of the actual digitization of the material. We will create master preservation TIF files for each of the documents and send them to Academic Preservation Trust, perform optical character recognition on corresponding PDF files using ABBYY, make the text searchable via Apache Solr, and generate JPG files for insertion into our Drupal database. Once finished, researchers will have the ability to download searchable PDF versions of the documents. In a practical sense, Lightning Rounds like those at DH@UVA can break up the more monotonous aspects of conference going by exposing attendees to a significant number of new ideas or projects in a very short time span. Earlier this year at the Annual Meeting of the American Historical Association in Atlanta, fourteen individuals gave DH presentations over the course of an hour. Then the panel’s organizer, Stephanie Kingsley, very kindly invited audience members with DH projects to show off their work as well. At the DH@UVA Conference, twenty-four individuals or teams gave these talks over the course of about an hour on a Friday afternoon. It was a terrific way to learn about work underway across the university, discover new potential collaborators, or think about curricular development with visitors such as Paige Normand from James Madison University. Pedagogically, developing and giving a Lightning Round talk can help students (or senior scholars) to distill a project or argument down to its essential elements. Mentors constantly remind their graduate students to have a brief elevator speech at the ready for that moment when they encounter their intellectual heroes in a conference’s book display room or when they land an on-campus interview featuring a dozen or more individual thirty-minute meetings. Participating in a Lightning Round is a good way for graduate students to hone their pitch and gain confidence in delivering it. The same lessons are applicable to undergraduates. In two research seminars on the American Revolution I had my students give longish prospective topic presentations to their classmates. My goal was to have them practice their public speaking skills and foster a discussion among them about their respective research interests. It did not always work out well. They often struggled to fill the allotted time, could not provide a clear sense of why their topic excited them, or why in their view it was important. In retrospect, I did not provide a reasonable structure for this assignment. In the next version of my course, I will structure these presentations as lightning talks to encourage students to think more concretely about their topic’s big picture. Hopefully, this will create a framework for class discussion that produces more questions than answers. The Lightning Round at DH@UVA enabled us to share the Court of Session digital archive project with our colleagues in the university community in a concise way. It forced us think about what we considered to be its most important aspects and how to communicate those ideas effectively. Crucially, it exposed us to new ideas that our colleagues are employing in their own work and led to interdisciplinary conversations afterwards that are beginning to shape our thinking as we plot out the project’s next phases. These Lightning Rounds create the possibility for meaningful, perhaps even electrifying, intellectual engagement.